In the Cali Co office building, employee health is important and crunch is discouraged! That's why to ensure that everyone gets plenty of rest, the harder people work, the more they turn into cats—until they nap away their sleep debt. In theory. The story takes place in and around the Cali Co office building, a multi-story affair that's in an unspecified city, at an unspecified time. What makes people turn into cats when they overwork? Is it because of a curse? A benevolent cat goddess? An experiment gone wrong? ALL OF THE ABOVE! So many strange cat-related causes have created this situation that whichever one you want to explain (if any) is valid! The extent or "maximum cat" of the phenomenon is up to you: cat people or actual cats, whatever works best for your story! Cali Co is a worker-owned company with a very open structure, so management is constantly shifting—and whichever company chart works best for your story is fine! The building is so big that space is leased out to other companies who need it, and the first few floors have a bunch of shops in a public, mall-like space—to maximize freedom and ensure folks' stories can coexist in a big snuggle pile. What does Cali Co do? A little bit of everything! Plus, they keep changing their focus all the time. This means that pretty much anything goes, and different stories can still be canonical even if they appear to be contradicting each other. You can specify what your characters are doing, or you can keep it abstract—it's up to you! There's lots of ways to contribute! ...or anything else that can be shared here! Once the jam is over, we'll look at the feasibility of collecting some of the submissions into an anthology, with each author's permission! What this means exactly is something we'll discover along the way as this is the first time we're doing this! But if an anthology happens, it'll be completely opt-in (there will be an option when submitting) and contributors will have final say on how their work is featured. The goal is to make a cool team project and get interested folks involved from the start! 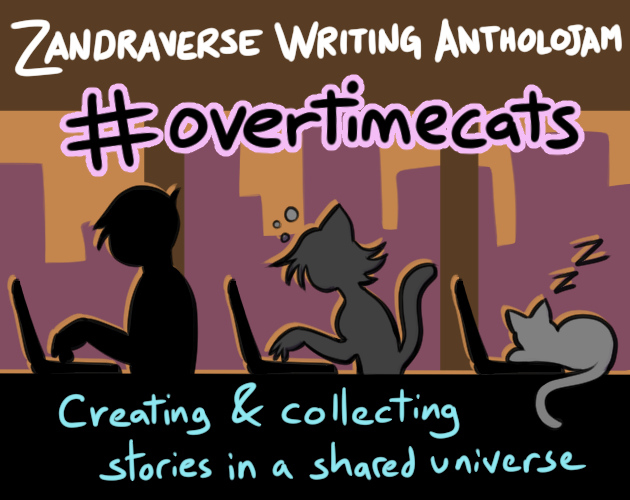 On twitter we will be using the hashtag #OvertimeCats - feel free to use this hashtag when posting about the jam or your entries! Need help with the light novel genre? Burying Myself In Work To Ignore My Dysphoria So Deep I Don’t Even Notice I’m Growing Cat Ears! A coder pulls a night shift and invokes a cat-astrophic curse! The true(?) story of the world's fuzziest CPA. Connie Congress and the Curious Conundrum of the CALI CO Copy Cat. This is a short story I wrote for a cat themed writing jam thing! What better place to study than in a Mall and Library full of Cats? Someone Settles for a Job, turns into a cat, finds themself. Story about a cat and debugging code. Sometimes in order to be your best self you need to start from scratch. A junkyard kitty gambles her life away when she follows an unusual scent. What happens when Cali Co has a health inspector call?